The use of re-enactment as artwork is by now an entirely familiar form. Whilst the common phrase would have it that ‘familiarity breeds contempt’, I do not wish to jump off from such an extreme position but instead amend the phrase to read: familiarity breeds orthodoxy of form. Orthodoxy here suggests a common adherence to set of expectations, inflexibility to playing with its particular form when in fact this is a much-required facet of re-enactment. 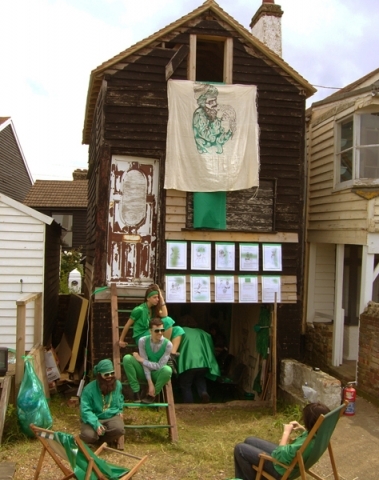 In contrast, two works within the recent Whitstable Biennale, The Saint/s of Whitstable and Approximating the Art of Stuart Sherman (Without the Spectacle) enacted a desired playfulness through an unclear relationship with re-enactment. Unorthodoxy that was mirrored in quite different ways in the lives/works of the restaged protagonists: Shabbtai Zvi and Stuart Sherman. Part of the performance programme curated by Emma Leach, Robin Deacon’s presentation about the late American performance artist Stuart Sherman was one outlet for what he described as a “burgeoning research project”. Listed in the promotional material as “a series of re-enacted performances”, this was not strictly true – at least this would not adequately describe the work that took place that day. Instead, the work consisted of various layers, characteristic of Deacon’s work: a video presentation of Sherman’s video self-portrait, Deacon reading a text outlining the project to date and “a series of re-enacted performances” interspersed with informal discussion. The multi-purpose hall that housed Deacon’s presentation, replete with makeshift rows of chairs, was indeed fitting for what felt like the temporary opening up of a space of ongoing research. This approach is certainly in keeping with his journalistic and documentary working processes, but also presents a certain contrast from earlier, more polished delivery. Prototypes, a work from a few years ago, explored a personal relationship to a section of railway track in West London through the intricately timed delivery – even down to the absurd need to change time to compensate for the track gauge scale – of a performance lecture. However the more recent work benefited from losing such a clear-cut format; whereby the component elements of the work served to point in the direction of others, including those that fell outside the confines of the 40 minutes sat in the hall. This sense of pointers carried across to The Saint/s of Whitstable, sited in a disused Fisherman’s Hut, where Oreet Ashery's research into enigmatic saints materialised as a theatrical group study session. Characters including various directors, consultants, actors and cast members worked through the first reading of a play: Shabbtai, Nathan and Sarah, a script for the study session itself as well as the purported play contained within. An enacted form of dissemination that pointed to the life and acts of the controversial 17th century false messiah Shabbtai Zvi; a proponent of a form of mysticism that stood in contrast to Orthodox Judaism. Alongside Shabbtai’s messianic claims, which received support from a large section of the Jewish diaspora, he was also renowned for what are described as ‘strange acts’ – behaviour deemed unacceptable – ranging from the riduculous to those that transgressed religious law and brought him into conflict with orthodoxy. Eating non-kosher food, repeating the four-letter name of God were typical, and Ashery points to more surreal acts such as the dressing of a fish as a baby to then push around the streets in a pram. These and other such performative acts formed the basis for excursions out from the hut to re-enact these 17th Century transgressions as street interventions in present day Whitstable. The layered re-enactment that took place as a workshopping process, as a play and in turn as a history succeeded in drawing a large crowd as it commenced. This contributed to a problem in the work’s presentation, in simply being able to hear the quite intimate dialogue; this coupled with a possible expectation of a more straightforward performance meant that a large part of the audience moved on. However, those who stayed were clearly engaged by a novel form of storytelling, and the play between our different relationships to the realities presented within the work. Orienting ourselves to the present participation within the workshop process, as well as to the historical characters referred to, which, up until this point, were unfamiliar. In a similar way, other than Sherman’s video self-portrait at the beginning of Deacon’s presentation I had not seen any of Sherman’s work, and therefore my awareness was inherently filtered via the re-enactments, leading to a pleasingly confusing attempt to respond to both artists’ work. With Deacon, and therefore supposedly with Sherman, the tabletop represents a microcosm – a world of objects where other rules apply, and the performer’s function becomes that of a force acting on these particular objects, transforming them through a series of rapid manipulations. There is something highly mechanistic in the delivery, but a mechanism with an unknown outcome: what step logically follows on from a toy mouse sat on a small chair facing a TV? Encouraging a child-like eagerness as we perch on the edge of our seats waiting to find out the next step within this re-enacted world. Deacon emphasised the word ‘approximation’ in relation to his presentation, quoting a past audience member who had stated: “all [he] had done was learnt a language without understanding the meaning of what it was [he] was doing.” However, just as a child learns a language through a playful mimicking, in playing with re-enactment both Deacon and Ashery offer up a form of understanding. Not straightforward information, but instead we are asked to orient ourselves towards an unknown: Deacon/Sherman or Ashery/Zvi. If Sherman’s work can be considered as thought-structure enacted through objects pulled out of an open suitcase, then in a similar fashion our attempts at orientation are enactments of our own thought processes in coming to terms with these revealed histories. Artist based in the UK.